Ben Kacyra recently presented at the 2008 Google Zeitgeist conference, an annual gathering of doers and thinkers from all over the world. His talk was included in the Serious Sustainability portion of the conference and focused on CyArk's mission of sustaining and sharing cultural heritage for future generations. The presentation even included a live demonstration of CyArk's laser scan technology. 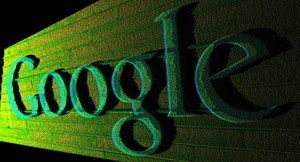 The conference was hosted at Google's Palo Alto, CA headquarters and covered topics ranging from the benefits of playing with Legos in the workplace, to GE's profitability of wind power. Notable attendees included Al Gore, Forest Whitaker, Carlos Slim, and Larry Brilliant. Included below is his entire presentation. 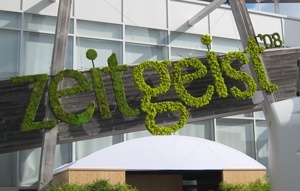 The Zeitgeist 2008 sign was composed of various plants, emphasizing the sustainability theme. One of the scans presented to the audience during Ben's presentation. 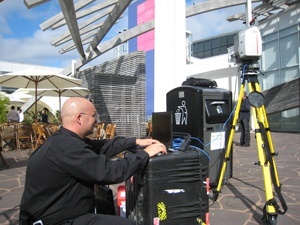 Birk Ellis of Leica Geosystems prepares the live laser scanning demo.